What causes cavities? Sugar right? Well, sort of. 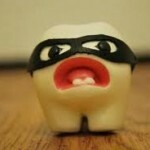 Ultimately the cause of cavities is bacteria that feed on leftover morsels of food in your mouth. Imagine them as tiny little creatures that love to eat and the more food they find in their scavenging, the more they burp and expel (in a manner of speaking). The ‘byproduct’ they release just happens to be acid and their ‘toilet’ happens to be your mouth. Gross. Acid, as you would expect, is not so good for the teeth or for your gums, scouring away enamel and gum tissue. Everyone knows that proper brushing, flossing, and use of a Pik can help flush out the acid after a meal. What is less well known is that once active cavities or gum disease is present, it means that the bacteria have taken up residency and are having parties on a regular basis in your mouth. The consequence is an expansion of the party to other people’s mouths with whom you share food, drinks, or kisses. Just as a cold can spread in this way, cavity-causing bacteria can too. 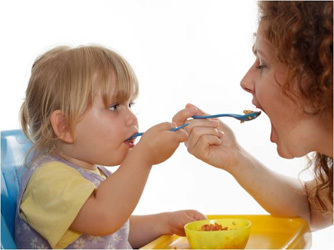 Primarily this is a problem for children who are particularly susceptible to this kind of bacteria and share food and drinks with their parents or caregivers. They also are less vigilant with the brushing. Since cavities in children are so difficult to treat (simply due to their lack of ability to sit still while being drilled on), it is important for parents to be aware not only of the health of their children’s teeth, but of their own as well. Treating their active cavities and bleeding gums quickly and completely will not only save their own teeth, but will help protect their children’s as well.